A Hampton Jitney with the Annett bus scheme, numbered 0432, presumably its former number. I think that was a bus that was brought up for the Summer. It's been said in the past Hampton Jitney has brought up extra buses for Summer use only. I don't think the buses were kept. Or at least that's what I heard, that the buses were brought up for the Summer season. Also never heard if the buses were kept. Though I saw a few Summers ago had gotten that treatment but kept their Annett numbers. Around 15 years ago Hampton Jitney bought a company here in Ft Myers FL. It was around the time they started the runs to FL in the winter. Happy Trails was the name of the company here. I was talking to one of the drivers here and they moved most of the buses to NY for the summer and had housing for the drivers plus a per diem also. In the winter they would use the NY buses here for charter work. Now I don't see much of HJ buses around now. #1001 and #1002 are at ABC Companies. #2202 and #2205 are J4500. #2301 is a former Toronto GO Transit unit, #2176. #2001 is a 2000 MCI 102-DL3, former Academy unit, Coastal Charter. 1) An article about Hampton Jitney buying Sunrise Coach Lines. 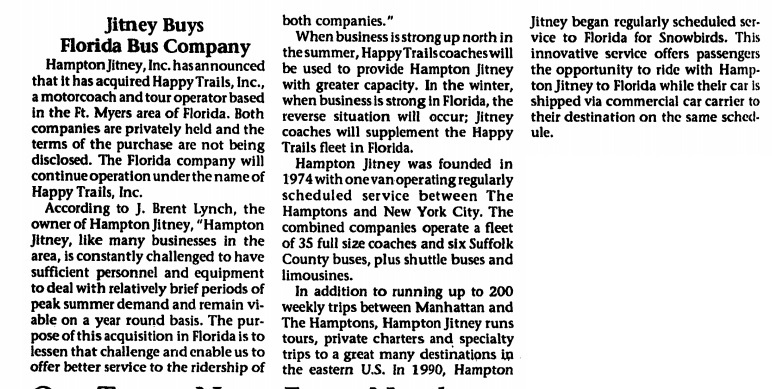 2) An article from 1997 about Hampton Jitney buying a company in Florida. 3) An ad from 1996. The article re: Hampton Jitney's purchase of SOME of the business assets of Sunrise Coach Lines is incorrect. 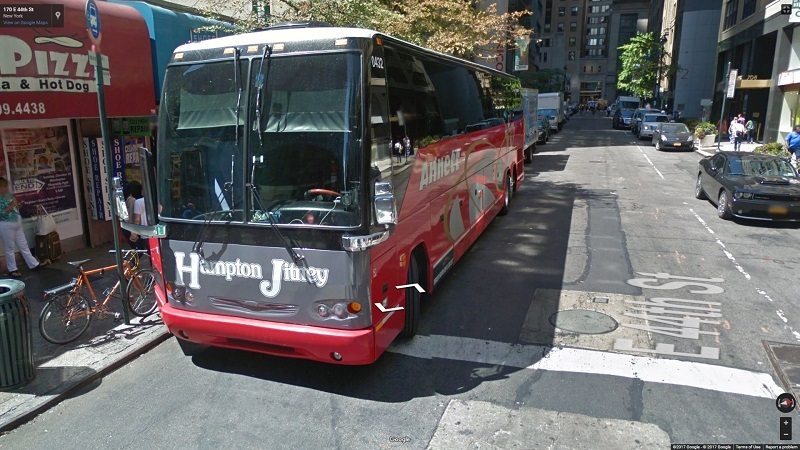 What Hampton Jitney purchased was the 14 Prevost motorcoaches, one (1) midi-coach (Freightliner chassis), the tour division (Tour About Excursions) and the NYC line run. They also took over any outstanding booked charters. 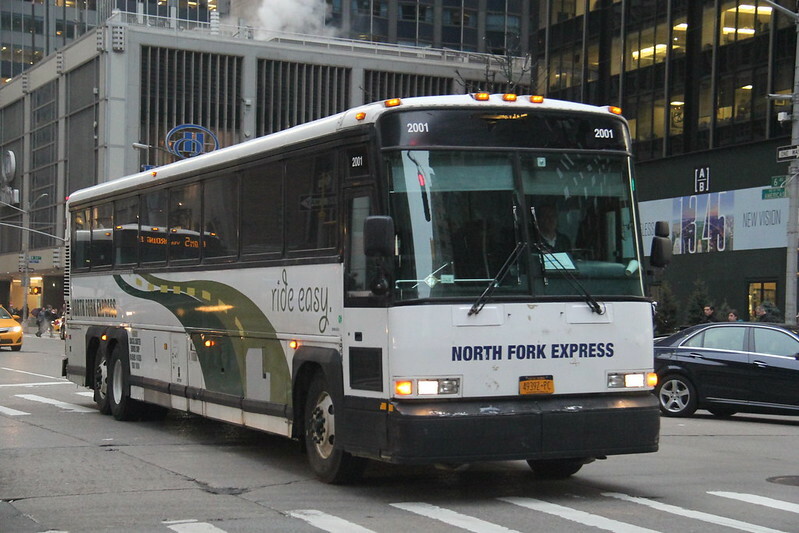 Sunrise Coach Lines is STILL in business as an contract operator of Suffolk Transit buses and a fleet of 14-passenger vans for various contracts and charters. The sister company Sunrise Busses, Inc. provides contract transportation to five (5) local school districts.